Wednesday 27th of July marks a key milestone in the construction of the Sarco Wind Farm Project in northern Chile with the arrival of the project’s power transformer. The Sarco wind farm, which was developed by Mainstream Renewable Power and is owned by Aela Energy, is located in the region of Atacama in northern Chile. The 220 MVA power transformer, which was manufactured by ABB Thailand, began the 230 km journey from the Port of Coquimbo to the project site in the commune of Freirina early this week and arrived on site on the morning of 27th of June. This component is one of the largest and most important elements that will make up the 170 MW wind farm. 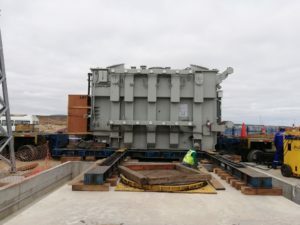 “The transformer weighs 116 tonnes and is designed to step up the voltage from 33 kV to 220 kV, which is the voltage required to connect to Transelec’s Maitencillo Substation. In order to connect to the Substation the energy generated by the wind farm must be transported along a 70km Transmission Line,” explains Rodrigo Hernández, Mainstream Renewable Power’s Contract Manager. The transmission line runs underground between the wind farm and the substation, where the power is stepped-up and then injected into the National Electric System (SEN). The Sarco Wind Farm Project is located in the commune of Freirina, some 70 km to the south west of the city of Vallenar in the Region of Atacama. When completed the wind farm will have a total of 50 wind turbines, each with an individual capacity of 3.4 MW, with a maximum total capacity of 170 MW, which is enough energy to supply over 260,000 homes.